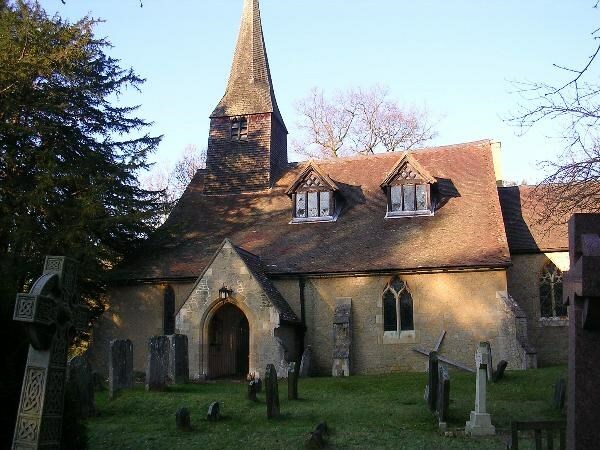 St Peter's Church was built in the 12th century and restored in the 19th century and is sited on rising ground close to Tandridge Lane just north of the junction with Jackass Lane. It contains Norman and Medieval elements but the general outward appearance is Victorian. The north and south aisles were designed by Sir G G Scott and constructed in 1874 and 1844 respectively. The chancel arch was rebuilt and much of the stained glass restored at this time. The church consists of nave of three bays, north and south aisles, chancel, vestry/organ chamber, west bell turret and south porch. The coordinates are just for the general area of the churchyard which you need to visit first, you are looking for an ancient tree which has a couple of signs at ground level.